So. Peepz always be talking about "thoughtful" or "intellectual" design. Putting a message or concept behind an outfit or collection, etc. Martin Margiela and Rei are probably my favorite designers for this. Rei is great at bringing out emotions like sadness or loneliness that are so much different than the emotions or features some other designers try to highlight, such as happiness or a glamorous disposition. Neither are bad, and I think it's great if someone can design a dress that makes a woman feel confident, but I have much more admiration for people like Rei that can focus on the more scary emotions that are harder to think about and harder to express through clothing (and I don't mean obvious ideas like making a shirt out of bullets to show how ~ANGRY~ you are or writing "ALL ALONE" on a t shirt, I mean the overall feeling and emotions a collection can not only express, but bring out in you as well). Margiela is great at making a point about something. I can't relocate the link I once had bookmarked with more details about this, but he did a collection in the 90's that just blew up Barbie clothes but kept the proportions. You can imagine what this looks like. BUT, I'm going off on a tangent. My point is, thoughtful design is the kind I most want to emulate (though I don't see a problem with designs based off the look of something: balance of colors, shape, etc. That's most of what goes into styling an outfit, no?) I find that it is much easier to put a concept behind an outfit when you're designing rather than styling, because, well, in design you can create whatever you want and in styling you work with what you have. So, this morning I tried the whole ~CONCEPT~ thing, though I'm not sure how clearly it came across..whatevs, it's a start I suppose? This is not to claim that I am some kind of //deeply//thoughtful// and //intellectual//person//omg read my poem I wrote//it's about rain drops and//crying blood//brb gonna go read some//really big books///about philosophy/// whatsoever, more an experiment to see what my tiny thoughts are maybe capable of producing. 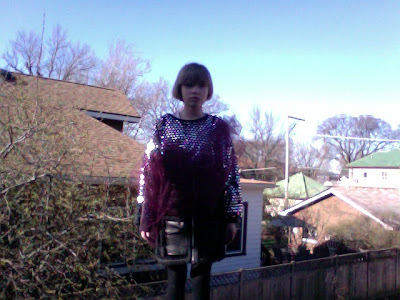 Anyway, yesterday a very awesome person named Annie dropped off this very awesome pullover. It has lots of very awesome little mirrors and I was making very funny faces in it all day! The idea is suburbia- the area around me every day, so it wasn't very hard to pick up on qualities of it. 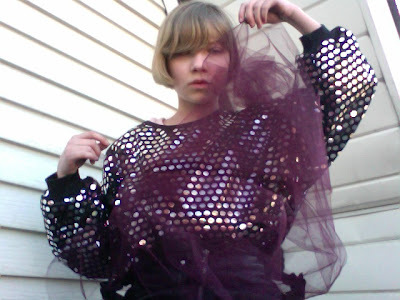 The tulle I pinned to random places on the sweater is supposed to make the mirrors look jaded. You can't get an accurate reflection looking into them. Since black leather is considered sort of "rebellious," the skirt represents the sort of rule-breaker we all are on some level..but since we are in suburbia, we're rather caged in, hence the cage skirt. This probably makes way more sense in my head/felt much less pretentious before I started writing this post, but it's an idea I'd like to build off of more. A possible photo shoot to do this summer, perhaps? Blah. We'll see. And while I have your attention-don't forget to check CWAC!